This week, Eadine Hickey of Eadine Hickey Coaching explores a critical area for all of us in the workplace – how to develop our emotional intelligence. 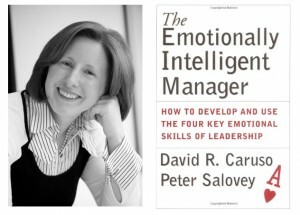 The Emotionally Intelligent Manager by Caruso and Salovey was recommended to me about two years ago but it took me until this summer to read it. In fact it was the first book I read on Kindle (which I now have a love hate relationship with!). The Emotionally Intelligent Manager presents a view (contrary to most corporate environments) that emotions are not just important to making good decisions, but they are in fact absolutely necessary. The book is organised around an ability-based approach with four specific skills which can be improved in order to become an ‘emotionally intelligent manager’. I read the book in preparation for a workshop with MBA’s on Emotional Intelligence. At the time I was trying to figure out the best approach to convince MBA’s that emotions matter in a work context. A discussion about emotional intelligence can be interesting in a corporate environment, as the starting point is often ‘but we don’t do emotions here!’ Having worked with two multi-nationals, I can absolutely appreciate this view-point, but having seen the merits of emotional intelligence in action I was searching for a good way of approaching the issue. The Emotionally Intelligent Manager presented me with the solution. The Emotionally Intelligent Manager proposes that Emotions are in fact ‘information’, information that should be considered in making decisions, in problem solving etc. We would not dream of omitting a piece of statistical data from a decision, yet it is commonplace to omit information relating to emotions. I was able to relate to this when I reflected on a change programme that I had managed almost 10 years ago. Whilst it was delivered on time and on budget (with my project manager hat firmly on), I now know that the project could have been a greater success had I incorporated emotions into my decision making. When reflecting on this and other experiences of leading change in organisations, I am absolutely convinced of the significant role that Emotional Intelligence plays in this process. I believe it is crucial to creating a shared need for change, shaping the vision and mobilising commitment in order to then deliver the change. Another theme within the book is the linkage between thinking and emotions. Caruso and Salovey explain through examples and whilst it makes complete sense on reading it, the concept is not something that we would be encouraged to believe in today’s business world. Imagine doing a brain-storming session when you are really annoyed about something. It’s hard to imagine the creative juices flowing as negative emotions restrict our thinking. Now imagine doing a really tough performance appraisal with an under-performing team member when you have just won the lotto. Again it’s hard to see how this is going to be effective unless you can ‘bring yourself down’ to focus on the issues at hand. The message is that in order to be an Emotionally Intelligent Manager, we must learn to match the mood with the moment. I would recommend this book to anyone looking to improve their emotional intelligence. This entry was posted in Book That Inspired Me on October 14, 2011 by Aodan Enright. I’m looking forward to reading this one in the near future. I like the idea of treating emotions as ‘information’ that needs to be factored in to decision making. We tend to do this on a personal level but it seems ‘weird’ to talk about it in most working environments. Sounds like those who ignore it are holding themselves back. This book sounds well worth reading – what happens with us that we end up “parking” the emotional stuff , clueless when you think about it.